A fascination with artist Colin McCahon's "missing hours" has led Auckland artist John Reynolds to take on a large-scale project at the Dunedin Public Art Gallery. He tells Rebecca Fox about his project. John Reynolds' latest work is titled The Falls and he is worried he may have set himself up for a stumble. "I could literally tumble," he says pointing to the three-tier scaffolding he has just come down from. 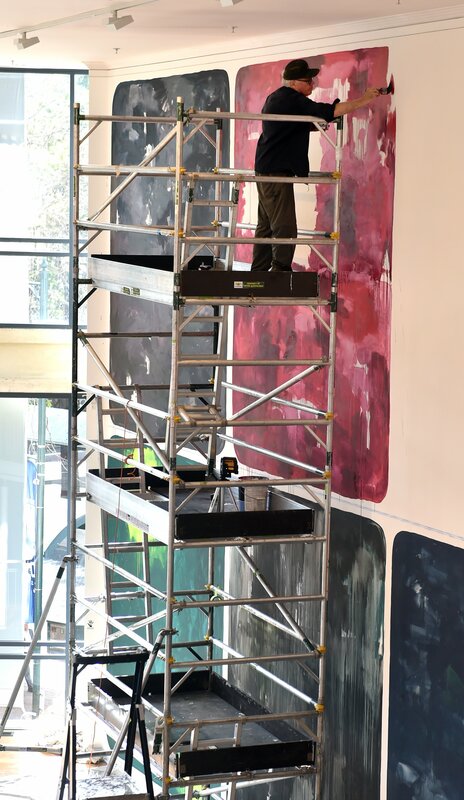 Only a few days into painting the "big wall" at the Dunedin Public Art Gallery, Reynolds, an Arts Foundation Laureate and two-times finalist vying for New Zealand's prestigious Walters Prize, is still a little nervous about the outcome of the work. He is not just worried about the height but about what he is trying to accomplish in the work - creating a response to Colin McCahon's Waterfall painting from the mid-1960s. "I'm trying to write a letter to McCahon. I call it The Falls as there is a danger here that I ape too closely another artist's work; you tip from inspiration into some form of parody or worse, pastiche. "I'm tipping my hat to Colin McCahon and pulling the rug from underneath myself. It's a rather ambitious and foolhardy undertaking." When first invited by the DPAG to create a work for the "big wall", he had envisaged doing a "vast wall drawing" using graphite stick. "It became more and more apparent that a painterly response was needed. That coalesced with a visit to the library at Dunedin [Otago] University, where Colin McCahon's waterfall-themed oil painting on panels are hung." As a young painter Reynolds looked up to McCahon as one of New Zealand's great contemporary painters. "As a young painter in the '70s in New Zealand you had to get around McCahon and the likes of [Ralph] Hotere - I was very lucky to work with him [Hotere]." And it tied into an ongoing project Reynolds has been working on for a couple of years looking at McCahon's "missing hours". McCahon went missing for 28 hours in Sydney in 1984 after taking the wrong exit out of a toilet in the botanic garden. He became disoriented and wandered off, leaving his wife and a curator wondering where he had gone. A search began, which included many well-known people from the arts community, one of whom was Hotere. The police found McCahon in a very distressed state, incoherent and without identification about 5km away. He was taken to a psychiatric unit in a hospital, where a nurse who had read the newspaper identified him. McCahon, who was suffering the effects of an alcohol addiction and had stopped painting, missed the opening of his retrospective at the Sydney Biennale as a result. "I got very interested in these lost hours; how he wandered the 5km between the botanic gardens and the centennial gardens. It was a very cold autumn." The incident was then used in a book by Martin Edmonds, Dark Night: Walking With McCahon, which Reynolds said he loved. "I went across to Sydney, met Martin and became very preoccupied with this story with what happened in those hours. Could I speculate as an artist?" So with the "big wall", Reynolds has broken up the vast space into panels, echoing McCahon's work, painting each panel a different colour. There are 14 scenarios configured on a "spiritual narrative" using McCahon's motif of the waterfall - a band of light in the darkness. "I'm not so disposed to that take on it but as an artist following in the footsteps of McCahon and who has an eye on some way reconfiguring McCahon's legacy, I'm taking The Falls in a more Samuel Beckett idea of the profound human frailty we all exist in through life. "I'm looking at a cinematic or narrative storyline that weaves down the wall. At the same time I'm trying to ransack that particular Christian motif to my own end." On to that he plans to paint a series of "plummeting falls" and layered over the top will be words and text drawn from his time in Dunedin. Looking closely at McCahon's waterfall works there was some tiny writing which gave him the "green light" to include text in his own work, Reynolds said. "There'll be quotes from literary sources and poets and a series of young musicians. I saw the Negative Nancies down here in November. They broke up the next day after I admired their songs." He also hopes to include references to Orientation Week and to his time in Dunedin working with Hotere in the early 1990s, when the pair created the multi-panelled Winter Chrysanthemums. "It'll be autobiographical. I'm trying to configure what I call the bloodline in contemporary art. All art stands on the shoulders of prior art. I'm trying to get the blood and bones of Colin McCahon in my life as an artist." He appreciated the opportunity to paint on such a large scale, Reynolds said. "I'm having my cake and eating it too. It's a unique opportunity. Honouring the tradition of large-scale mural painting." Many galleries looked straight to digital art as a medium to fill such large spaces today, he said. Not that many had the height and drama of a multi-level space such as the DPAG's. "It's a great pleasure. Painting can respond fully and richly to an opportunity like this in the ways I think a lot of places look to photo media to do." After finishing the "big wall" Reynolds is heading to Australia, where he plans to create the "final episode" in his McCahon missing-hours project by going to the Sydney toilet block where McCahon got lost from and declaring a new Great Walk of New Zealand - a 5km urban walk with no pathway. "It will reclaim a New Zealand story in Australia and we'll document it in the next book." Reynolds will take art patrons from New Zealand on the walk, which will have no destination. He believed it was important to mark not only the great times in a great person's life but also the tragedies, he said. "By doing that we understand their life more richly." There is an irony in the story, Reynolds says, as he will turn 63 this year, about the same age McCahon stopped painting. "Yet I feel I'm just getting started. McCahon had this astonishing body of work (by that age) yet I feel I'm just hitting my straps mid-career." • Artist's talk: Reynolds talks about his "big wall" project, DPAG, 11am today.